Expert Authors Always Double Check Their Work! These mistakes add more time to the submission process; and nobody enjoys reading an email with bad news about their recent article submission. Don’t be that author who submits articles that appear sloppy or thrown together at the last minute. When you’ve completed your article, you should feel confident about the end result and that your readers will be pleased with your effort. Read more for 7 common areas that are often overlooked in the article submission process. These reminders will save you time so you can worry about other things, like your next article! 1. Missing Content. … Is this a test to see if I’m paying attention? Phrases such as “Click here” need to include active links. Copying and pasting alone can strip HTML tags. Oh no! References to images, tables or charts should be removed prior to submission since they will not be seen. Language such as “find me on Twitter and Facebook” needs to contain enough information for your readers to actually find you at these locations. If you don’t take the extra effort to ensure your article has everything it needs for the best read, your audience won’t take the effort to finish it. 2. Author Name Confusion. … Who would have thought? The author of this article changed from beginning to end. Everything needs to be in place for a quality article to have the best impact on your readers. One thing that absolutely needs to match is the Author Name! For example, if Tom submits an article and the Resource Box reads, “Kathy is the author of this article” …. What will your readers think? Likely, they will be confused and all article credibility will be lost. In addition, always ensure any reference to the author’s gender is consistent with the Author Name. For example, if “Tom” wrote the article and there is a male in the profile picture, the word “she” should not be used throughout the Resource Box. Click here for a useful Guide to Managing Alternate Author Names. 3. Linking to the Same Article. … Hmm, I remember seeing this before; was it just now? This next blunder may seem minor, but needs to be avoided. In order to provide the best possible experience, always direct your readers to a link that relates to the content provided in the article. This sounds easy enough, however, the link needs to be NEW content. In other words, it needs to be a new avenue for your readers to explore. In today’s fast-paced, daily explosion of information, you don’t want to lead your readers to a page they just read! Stick to the same topic, but expand further on your article by introducing a different perspective. 4. Repurposing Issues. … I thought this was an article. Now you’re telling me it’s not? Your content should never be referred to as a blog, newsletter or anything except an article. The introduction of your article needs to start as a new article, not a continuation of a previous article. If your content was previously part of a video, audio series or blog, ensure the language is properly translated throughout. The bottom line: If you’re submitting an article to an article submission site, ensure that it screams ARTICLE and nothing else. Don’t create confusion! 5. Stolen or Spun Content. … I’ve read this twice and still can’t understand it. Is it me? There are 2 parts to this one, and they are some of the worst blunders an author can commit. First, all articles you submit need to be 100% original and unique content to which you have the exclusive rights. Content stolen for your own personal gain is more than just a blunder, it’s plagiarism and is unethical, illegal and will severely damage your credibility. Second, content should never be derived from an article spinner. Even today, there are still authors who attempt to submit content using article spinning software, and thankfully, they never succeed. To avoid account suspension, the largest blunder of all, avoid article spinners at all costs. Instead, take some time with your writing … You owe it to your readers! If you need help with creating unique content, this blog may have the tips and advice you need. 6. Word Count Oversight. … Why is this article so thin and repetitive? Article submission sites have word count guidelines to ensure content meets the optimal industry standards as to what is deemed to be substantial quality content. Regarding the minimum word count, there are no ways around it, simple as that. If your article happens to be under the minimum word count, it’s not acceptable to insert a random quote, add generic filler, or a short blurb about your company. Keep in mind, quotes and other filler aren’t considered toward the minimum word count; only the content that is 100% original counts. Respect these guidelines and your readers will appreciate your effort. 7. References Not Cited. … This author must be a genius, these facts must be difficult to remember! Touching again on original content, it’s perfectly fine to use facts and quotes from other sources. However, it’s important this content is accompanied by a citation in your article, as well as listing a full reference at the end of the Article Body. You may know your material, but anything taken from another reliable source needs to be pointed out properly in your article. Give credit where credit is due. For more information on how to cite your content, refer to this blog post. In order to ensure your article is original and everything is in place for submission, remember to make it your final draft! Don’t be afraid to grab somebody else for an extra set of eyes to look over your content. It never hurts to get another perspective to help you avoid any article submission blunders! 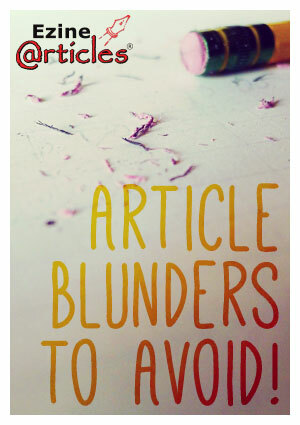 Do you have any tips to avoid careless mistakes in your article submissions? Share below! Completely agree with the first point. Most of the time in a hurry we miss anchor link URL and kept click here. Which is annoying for user to read. Nice article. I found one of the bast ways to catch mistakes is to put the draft away and then read it a day later. I always catch things I could not see the day before. I wholeheartedly agree with Joe Shiller (above). I always put my articles out of my mind overnight – or longer – before publishing them. I’m always surprised by the “obvious” errors I find when I re-read my articles a couple of days later. This is a very good way to proof read everything we write. Informative article. Found many good points. After reading this article the mistakes you mention are so true. Not understanding the patience required for article marketing will cause frustration and move you to look at article marketing as wasting your time. The points made in the article reiterates that this process is a journey an not a quick fix. Also it would be good to a have service to submit your articles if your budget allows it. This post reflects the important and major mistakes during the submission stage. ‘ Missing Content’ is the frequent problem that occurs when a final article is copied and pasted from the saved draft. You can add one more blunder as ‘ Title relevance to be checked’. When more than one article is submitted at a time, the contents of one article are posted under a different title by oversight. I can see the importance of Article & content on others blogs. I also like visiting articles & writing articles when I have the time. I also ask a question at the end of each post to encourage discussion on my articles. Whilst it’s very good to encourage good writing practices sometimes your moderators are not only picky but petty. I have had articles rejected and have had to write back pointing out errors that the moderators have made. In the end, it’s about communicating information not about how absolutely perfect a person’s grammar and spelling is. The point I am trying to make is that if you expect such high standards from your contributors then you should apply the same to yourselves and that it is the spirit of the thing and not about finding fault for the sake of it. I have used 2 grammar and spelling checkers on this comment. Thanks for your feedback. When editing articles, we try to fix any small errors we can as it’s always our goal to help get the articles approved. If you ever feel your article was incorrectly placed in problem status, feel free to contact us in Member Support and we will certainly take a look. From a creative writing course I did a few years ago the tutor suggested another way to proof read your article or story is to read it backwards and this quite often highlights errors missed when reading in a conventional way. Another tip from the same course is to read the article out loud and if possible have someone listen. If you find you are running out of breath during sentences then shorten them. Hearing something read will also highlight errors not picked up during a silent read through like repeating words or phrases in the same sentence. Good article helping to refresh what we think is obvious. Good piece here. I am learning better writing practices every new day. By following these useful tips we can easily produce a useful and unique article. Your pointed major mistakes and aspects which mostly writers neglect while posting their articles to websites. This is a great pointer and although it makes common sense, I didn’t know the exact, proper length of a sentence. In historical, great literature, the sentences always run too long so it looks like that is the way it’s supposed to be done, but you are saying to write as though one is talking, using the breath as the grammar and punctuation markers. Interesting writing tip which should be obvious, yet it such a simple fix that it is easily missed! Yes,It is really helpful to create a qualified article. Wow so nice idea to easy article submission blunders.I think it is very effective for article submission users. In addition to being a creative (Diamond Status) writer I am also an artistic painter of landscapes and a meticulous carver of lifelike raptors and other birds. When I write I try to use words in the same way as I use my brushes and carving tools so my readers will be able to visualize – in their minds – a picture that my written words create for them. I enjoyed reading the words of Terrance L. weber. I do share the same feeling as a poet when I start writing my articles. I keep the audience in mind so that only useful and interesting information is included in my writing. These guidelines are really informative for writers. I enjoyed reading this article. Thanks for the great tips. I am always open to learn new things. I thank you again for sending me something new always. Alan is absolutely correct about reading the article out loud. After having a dozen of my friends, the publisher, and me edit and proofread my book multiple times, I found a mistake in my book when I was reading the book to match the audio version. Thankfully, the narrator said it correctly; however, in the printed copy I have “that” instead of “than” in the printed copy. Thank you for this information, as I grow as an author of articles the 7 points shared will become a blueprint to do so successfully. Very useful information. It is great to have some solid guidelines to refer to whilst creating quality articles. I am not an expert author yet, but I strive to on there. Actually, I have a lack of grammar in English, so I must learn harder. I really want to be an expert author, so I want to thank you with your guides here. Thank you for this helpful article. I was helpful to know with my future articles. I have had articles rejected and have had to write back pointing out errors that the moderators have made. In the end, it’s about communicating information not about how absolutely perfect a person’s grammar and spelling is. Great article, I get a lot of emails offering to sell articles at silly cost, I even had some sent to me for free, but when reading them they just did ot make any sense. While I submit my article, blunders have made me overwhelmed. Regret that Still I am not a success in submission process. A lot of very useful information was presented in these posts. It must be almost impossible to write an article using correct syntax, grammar and punctuation when publishing an article in English when that isn’t your first language. After 2 years of trying to learn French while living in Minnesota, I am lucky if I can communicate anything in French. If you don’t use it, you lose it. My advice to new article writers is to keep writing. The more you practice your writing skill, the better writer you will become.